Shin, Calf & Forearm Brace With Gel Ice Pack,Hot/Cold Circulation, Compression, Mobility & Pain Relief! Abduction wedge has been the therapist’s choice and most trusted brand when it comes to orthopedic supports and hand therapy tools.This products are designed with the patient and hand therapist in mind, and occupational therapists, physical therapists, nurses, and other health care professionals rely on products to assist the elderly and those with disabilities. products include therapeutic putty, overhead exercise devices, slings, rigid and soft orthopedic supports, wrist braces, therapeutic and thermoplastic splints, straps, fasteners, and range of motion products. 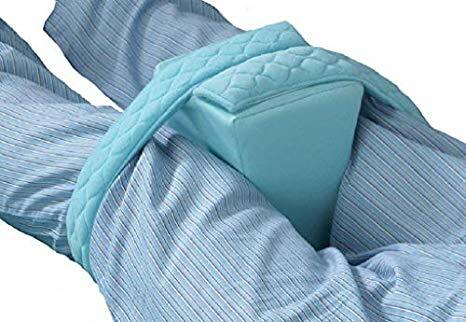 These are the same high quality professional products used in hospitals, clinics, and nursing homes.The Shoulder Immobilizer & Sling is designed to gently cradle the arm in the bent position from the elbow to the hand. The sling can be separated from the pillow and used independently. The shoulder strap is made from a soft dual ply material. There is an adjustable pad over the top of the shoulder. The shoulder strap is adjustable w/ Velcro at both ends of the sling. The pillow is made of foam formed to nestle against the side of the body. Can be used for the left or right arm. Abduction Wedge is for users post-surgery to immo. Supports the hip and leg from sudden movement and. Knee spreader block is great for users recovering. Standard foam block, size large, measures 8 inch. Non-latex can be used to immobilize hip and legs. Highly adjustable with hook & loop (Velcro) fasteners. Anatomically shaped positioning and abduction pillow. Fits Left or right arms. 1 SIZE Fit For All.